We’ve got a very special download for you this week: an entire chapter of our upcoming book by best-selling author and noted lecturer, Rabbi Yissochar Frand. Tens of thousands of people around the world have been inspired by Rabbi Frand’s lectures and books, and with good reason. Combine his insightful ideas with his engaging presentation, and you have the recipe for inspiration and growth. 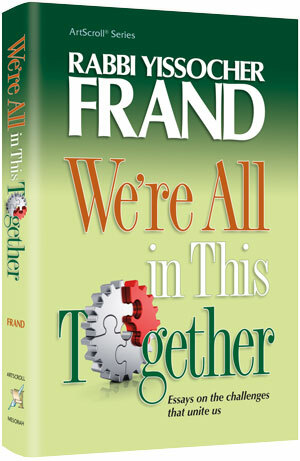 In this almost-released book, We’re All in This Together, Rabbi Frand shares essays on challenges that we all face. Learning Torah, doing teshuvah, teaching our children…these are areas where all of us can use a boost in the form of Rabbi Frand’s inspiration. For this week’s download, we’re offering you an exclusive, pre-release chance to read of one of the chapters of this book. Because it’s Elul and Rosh Hashanah and Yom Kippur are rapidly approaching, the chapter we’ve selected is on Teshuvah, entitled Protecting Your Teshuvah Investment. Read it. Share it. Allow yourself to learn and grow. We’re All in This Together will be shipping on Monday, 9/8. Click here to (pre)order your copy. Click here for all titles by Rabbi Yissochar Frand. If you enjoyed this post, please spread the word of our free weekly download series.